Going "out" for New Year's Eve is so 2015. The older I get, the more I simply desire staying in or spending the evening with a few close friends. 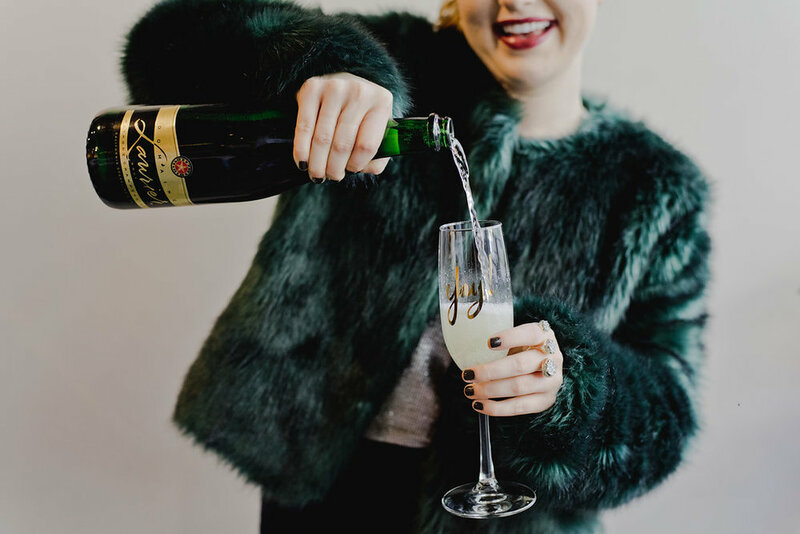 All of that in mind as we creep into the end of 2017, I felt inspired to create a girls' holiday/NYE shoot. Because I'm obsessed with SF, I wanted the venue to be based there and somewhere niche that felt like every girls' safe haven. Somewhere that lived and breathed "city sleek." 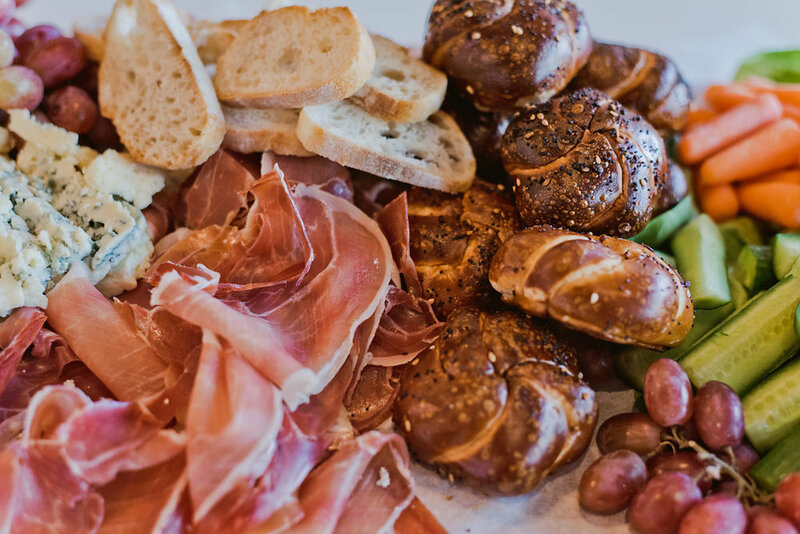 Enter, Wine Down in SOMA! As we're all probably aware by now, metallics and velvets are taking over the fashion world for the fall and winter months, so that was where my initial inspiration came in. I wanted to play off the natural textures inside the bar, particularly the wood. There is something so inviting and warm about it. 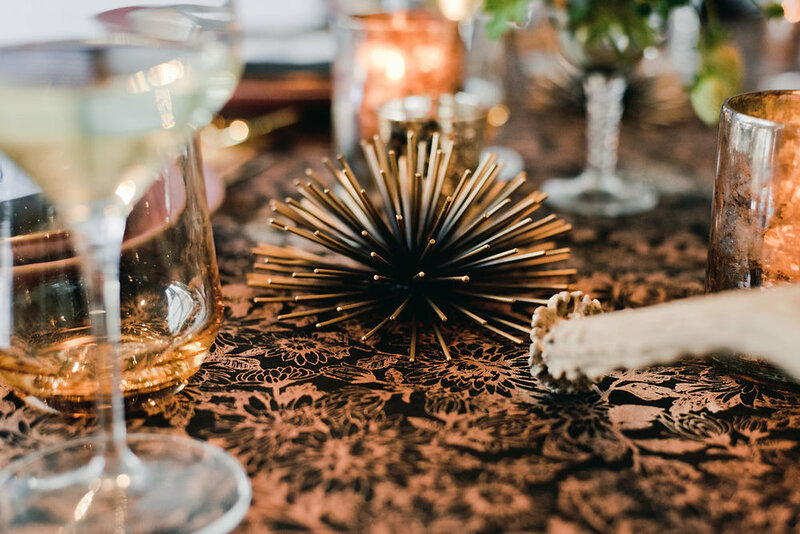 I decided to go with a bare tablescape, paired with a sleek black and gold runner from Lavish SF to keep things clean. My amazing friend and vendor, Angie of Chairs and Cups helped me conceptualize the perfect plateware/stemware set to make everything flow cohesively with the colors we had chosen. The best part was accenting this table with mercury votives, wooden antlers, and other odds and ends I sourced from Eileen (owner of Lost + Found Vintage Rentals). 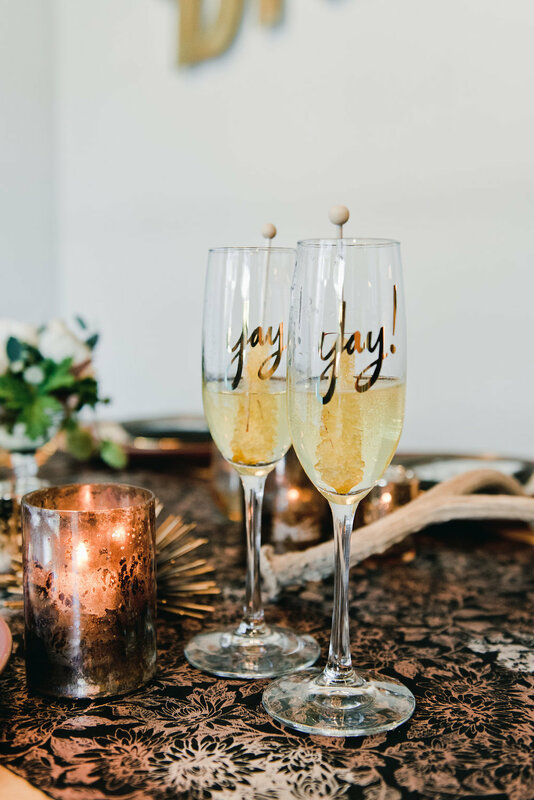 I hope this shoot inspires anyone planning a party to not be intimidated to go BIG on the details. I think that a tablescape that is well-thought out is one of the most important pieces of planning a perfect party. 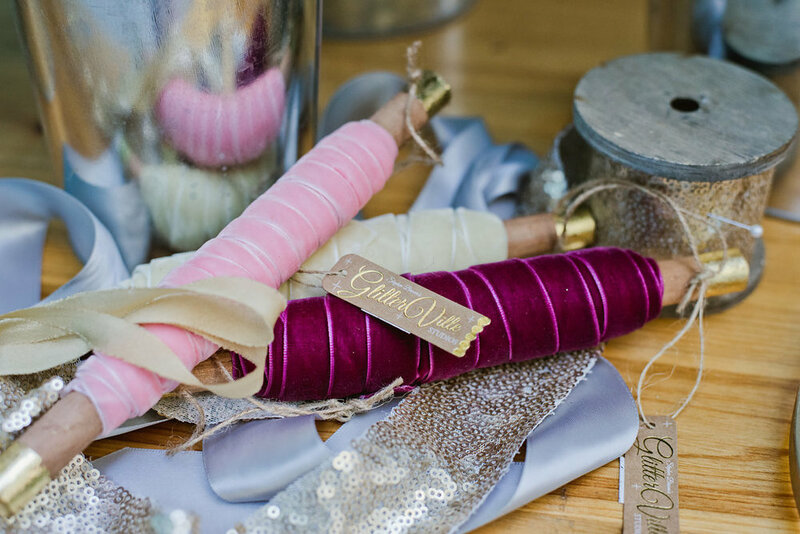 I really wanted to incorporate something that would make the table pop (but not in a gaudy way) and working with Angie (owner of Bobo Design Studio) was a dream. She came up with those gorgeous diamond-cut personalized name cards for each of the guests. ProTip: always incorporate some type of interactive activity for the guests. In this case, I wanted it to to be DIY-related. I've worked with the amazing Keegan (owner of Petal Atelier) for over a year now, collaborating on different projects, and she knew exactly the route I was wanting to go down. She suggested a DIY floral wreath station. I wanted the aesthetic to be neutral enough where it didn't scream Christmas at you, so we went with very earthy florals and greenery for these wreaths. The girls had an amazing time using the tools and creating some fun wreaths to take home. 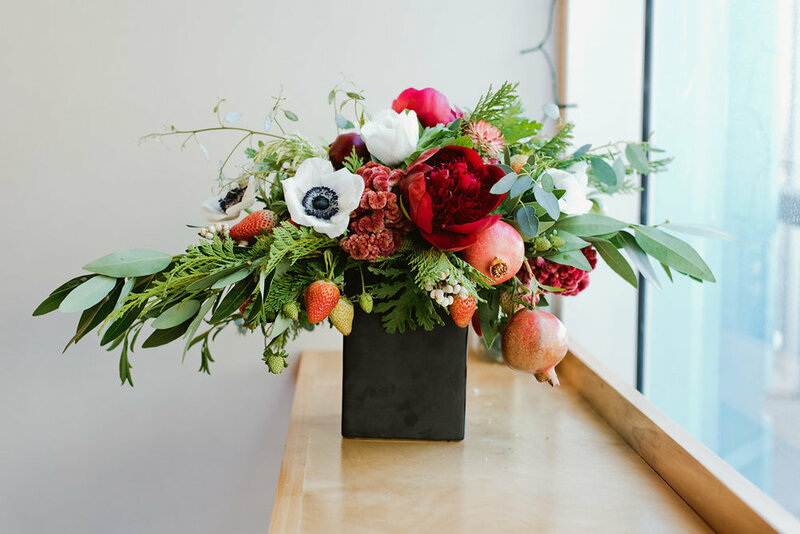 PS: How stunning are those bigger bouquets with strawberries, pomegranates, and anemones?! We were jaw dropped at their beauty. Then came the cake! Rachel (owner of Bay Cakes Design) came up with a perfect mini cake to round out the party. I knew I wanted black and I have admired her work for a while now, but she blew me out of the water with the detail she added with the sugar flowers on top of it. 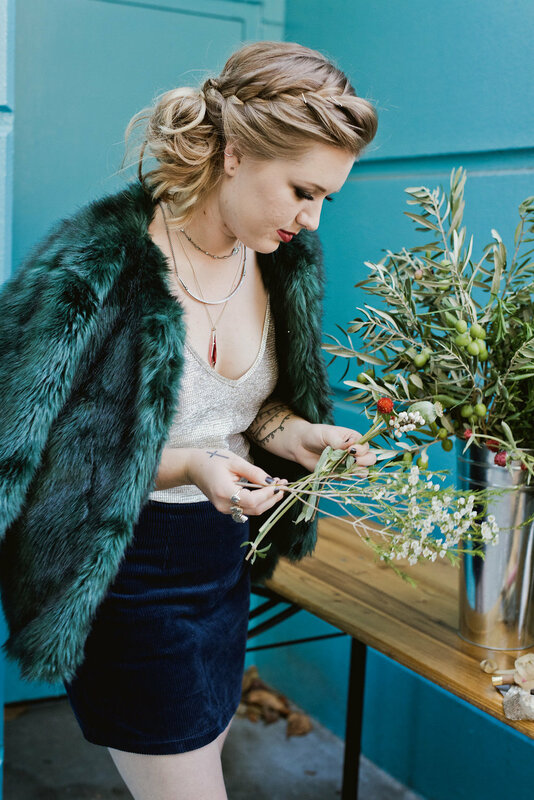 Sitting it on top of Lost + Found Vintage's bar cart with my felt board was one of the most inviting vignettes of this shoot. Rant of the week: I'm annoyed because almost all of my shows were cancelled this week due to something. One of my biggest pet peeves is being so excited to watch your shows on DVR from the night before -- and then you get situated and lounged in front of the TV, only to find that none have been recorded! Gossip Girl, Parenthood, Private Practice, Grey's Anatomy, AND the Challenge were all no where to be found this week :/ Sure, I saved some time and was able to be more productive with my nights, but come on, we all know that TV is my mistress. Excitement of the week: Okay, done with the spoiled brat rant. It's officially NOVEMBER! My favorite month of the year. And no, not ONLY because it's my birthday month, but because it marks the official start of the holiday season, as well as good old Thanksgiving. Thanksgiving has always been my favorite holiday, and maybe a part of it is because I feel like it's the underdog holiday that always gets shafted. I got my mail yesterday and I'm already getting catalogs from Macy's with Christmas tree decor deals. Starbucks' holiday cup is out with snowmen on it. People have their lights up. Christmas music is flowing. I for one, am the biggest fan of Christmas time, but come on people, let Thanksgiving shine too!! Haha, I am the biggest Thanksgiving advocate. I think it's just as important to take a step back and truly immerse ourselves in the season of 1) giving thanks for our blessings & 2) actually giving to others who are less fortunate. I wanted to challenge myself this month to get outside of the "me-me-me" mentality I tend to stick in. Instead, I want to challenge myself to do something every day for someone else. It doesn't have to be buying an elaborate gift for someone every day, but even sending a kind note, doing someone a favor, or even smiling at a stranger. Anything that involves me giving back to those around me and passing along kindness. That's why this is my favorite time of year. In addition to the leaves changing, the crisp fall weather, and the yummy home-made treats, we are entering a season where we can reflect and give back to those around us. We can take this time to step outside ourselves -- and wow, what a humbling, intrinsic reward that leaves us with. Happy holiday season to all of you! What are some of your ideas in challenging yourself to give back this season?